LOVE your card, Christina!! It brought a smile to my face ... anyone who receives it is a lucky person, no matter the age. Love your Minnie card Christina! Would like to know where you found that red polka dot paper...it is perfect. I can never seem to find the right size dot. Thanks for joining us on our hop! Love your card Christina! Minnie makes a perfect shape card! Awwww Minnie is too cute!! I love your Minnie card. She is so cute! Thanks for the chance too win. I love it! I have NEVER made a shaped card . . . I don't have a Gypsy . . . but now I want to try one! Thank you for being a part of this hop again. I always love your projects! Love this Minni Card, so adorable! Thanks for sharing and reminding me to use this cart!! wonderful card of course, I love all of your projects. Thanks so much for being a part of this great hop. Aww, I haven't made a card like that in ages. So sweet! Thanks for the inspiration! I love Minnie!! Your card is adorable!! Your card is adorable! I love your work and visit your blog daily! Shaped cards are the greatest and your Minnie is no different!! I especially love the red polka dot bow. Cute!! What a great card! I know someone who would love this card! She love all things Mickey & Minny! Thanks for the chance to win! How stinkin' cute! Great job! Boy, she turned out great! I'm happy to be in this hop w/ you. Love your card! Beautiful job! I look forward to each of your post and your videos. Keep them coming! What a cute card! I have that cartridge, but haven't used it yet. Can't wait to try a shaped card now! Cute card! Why didn't I think of that.....thanks for sharing! How cute! I have never done a shape card! Thanks for sharing. I love this card Christina. Hope all is well with the new kittys. What an adorable card. It would be cute for children, but also fun loving adults. Thanks, Christina. Looks like a fun cartridge. Would love to win it. Your Minnie card is so cute. My granddaughter would love it too!! Thanks for all your inspiration! I love your shape cards... and this one is so cute.. It's so cute. I love it. Very cute card! Thanks for the chance to win such an awesome prize! What a great card! I just love Minni and you really did a super job! Thanks for the chance to win the cartridge. Love the card. I have used the cart a lot, my 42 year old sis is a Mickey lover, even has a Mickey phone. You are the greatest, keep up all your video's and wonderful ideas. Thanks for a chance to win the cart. Such an adorable card. Who doesn't love Minnie Mouse! Christina, you were right. The Minnie cut made a beautiful card. Great Thinking! Happy to be a new follower from the DP Blog Hop! Love the card. What a great idea. 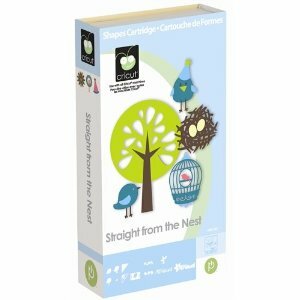 Would love to win the "Straight from the Nest" cartridge. Thanks for the chance. Hi Christina! it's been awhile, but what a great surpirse this morning with the Minnie card! She's fabulous! Anyone would be lucky to receive a Minnie card like this! Love the Minnie card! I've never made a shape card before. This one makes me want to try. No time to hop today. Just thought I'd check your site to see what you've been making lately. Hi Christina. I tried making a shaped card with my gypsy a couple of times, but for some reason it didn't match up correctly when folded. I've watched you do it, but for some reason I haven't yet succeeded:). Great card, just love it. Your Minnie Card is adorable. Love it! Thanks for the give away. I'd love to own this cart. Thanks again! Ah that is the "mouse adoriable" card. thatnks for the chance to win! Fabulous card! Love it! I'd also love to win the cartridge. Many thanks. Love your blog! Your Minnie brightened my mornig when I saw it. Thanks for sharing so many techniques with all of us. I watch you and I am not so afraid to try things. Thanks for a chance to win this cart too. Christina! I love this card. Please do a tutorial!!!!!!!! PLEASE!!! What a cute card! Makes me smile just looking at it :) I've never tried to make a shape card before, but this makes me want to try one now for sure!! Thanks for sharing. Very cute card!! The tiny pieces on these images always intimidate me but it is probable not bad when you make it card size. I will have to try it!! Love that shaped Minnie card. What a super sweet card. Who doesn't like Minnie! I love the Minnie card! I would love to get that cartridge...I have the Mickey font but really want the Disney one so that I can create cute projects like all you ladies have! I just love this card - and my granddaughter did as well! Made us smile on a raining day! Thanks! Adorable card, Christina! You always do such a great job! Oh! I have to follow this blog hop! I love Disney and I have been putting off getting this mickey and friends cartridge! Who doesn't just love Minnie or Mickey! Your card is adorable. Thanks for a chance to win your give a way. This card is adorable - I also love to make shaped cards and Minnie was the perfect choice. You always make such nice projects - thanks for sharing! Awesome Card. I just love Disney! Very cute Card, Minnie is so cute!!! TFS!! And thanks for the chance to win such an awesome cartridge!! 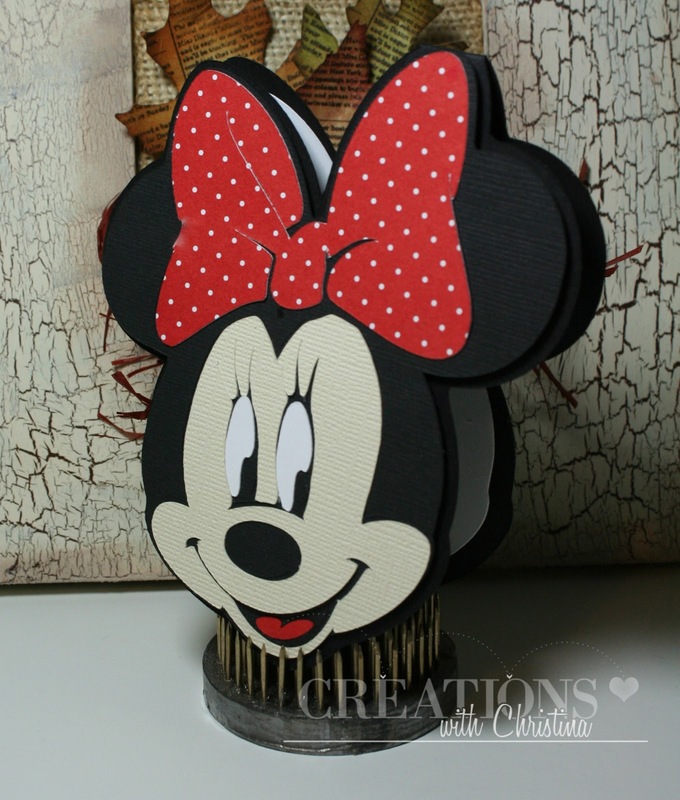 Hi, I'm a new follower and I'm glad I did stop/hop by your blog1 What a super cute Minnie card. LOVE her dotted bow. My 3 grand-daughters are in Disney today so we ALL love Disney and I'll have to try & make one of these for them. TFS your creativity & candy offer & please stop by & say hi. What a super cute minnie card! I couldn't find good friends connect, so I am a new subscriber! Thanks for sharing! Love your Minnie card is so cute!! I am your follower from years and enjoy every post!! It was such a nice surprise to have a Saturday post from you. The card is adorable. I love the card, it's adorable. And, thanks for the give-away. Really great Card. I just loved the image. What a cute card! Never thought of a shape card with my Disney cart. I have been subscribed & watching all your you-tube videos for a while but for some reason, never came to the blog. I am now a follower via e-mail and networked blogs on Facebook! I have also liked your Facebook page. Love your creations! I love Minnie she is my favorite behind Mickey of course. Such a cute card :0)! Love the Minnie Mouse card. I don't do many shaped cards either. Thanks for the chance to win. I've really been wanting that cartridge. I love your card! Did you use your gypsy? Who does not love Minnie? Love your blog. Great card! I love seeing all the shape cards that everyone makes, but I haven't yet tried to make one. Thanks for the inspriation! Hi Christina - I love your card. We are going back to Disner for our 25th anniversary in Nov. I LOVE your card!!! It's adorable! I'm such a huge fan of Disney's characters! Thanks for the inspiration and for the chance to win that beautiful cartridge! Your cards are always so imaginative and such fun. I get great ideas from following your blog every day. awesome card!! thanks for sharing! I love shaped cards. Yours is so cute! TFS and thanks for a chance to win. Love your cards and your tutorials! I have seen this cartridge but never bought it --- maybe I'll win it. I just ordered the CTMH Art Philosophy cartridge because of your videos using it. I follow you. I love that card. I could use that many times as my family is a great Mickey lover. We love going to WDW! Love Straight from the Nest and don't own it so thanks fir the opportunity!! Just a new follower. ;D Also just wanted a chance to enter the giveaway. Your Minnie card is so cute, I'd love to know how you create the shaped cards. Thank you for an opportunity to win this great cartridge. Thank you so much for the opportunity to win this cartridge! I would just love to own it! Love the Minnie card! I have that cart...need to look at it again. This is such a cute card! Thanks for a chance to win! Very cute card, Mini will put a smile on everyone's face. Love the card. Would love to win the cart. Thanks for all your inspiration. I love this card! My daughter is IN LOVE with Minnie! Thanks, Christina. Super cute card. cute minnie! thanks for hopping and for a chance to win. i love 3 birds. Very cute. I think I'll go look at the others. Who doesn't love Disney? What a fantastic card, so cute. Please may I be entered into the draw for the cricut cartridge. May I also say that I purchased the Cricut Gypsy on Monday and guess where I went for a real in depth tutorial - yes you've got it, your site of course, It was brilliant and far more understandable than the manual, Thank you so much. Very cute Minnie card- make a great shape card. Your Minnie is adorable. I love the bow. Love the Minnie card, it is so cute. Love your card!!!! Glad to be in this hop with you!! Minnie is adorable! I need to make a shape card & this is a great one to try. Super cute Christina!! I'm always amazed of how super cute all your projects turn out! Thanks for the chance to win a cart, you are so generous:) happy crafting! Use to work for the Mouse as in Disney World FL so I like everything Disney. Great card. Thanks for chance to win. So cute! I love shaped cards! TFS! Very cute card .Well done. Love Disney! Minnie always makes me smile! What is that thing that is holding the card called and where can I buy one? Another terrific card! You're the best. Thanks for all you do. Super cute card! I love shape cards. great card!! I always forget the other great options of these carts. Thanks for sharing. Really great Minnie Mouse card Christina Very very cute! Love that Minnie card, Christina! She's just so cute! Makes me think of when we took my sons to Disney World when they were little, and they were so excited to get to go to Mickey and Minnie's house ~ so cute, and such a fun memory! Thanks for sharing it! Such a cute card! Thanks for the chance at the cartridge too! Love the Minnie shaped card. Great looking Minnie card! Nice job...thanks for the chance to win. What a cute card! makes you want to go to Disneyland. Thanks for the giveaway. Cute Minnie card! Thanks for the chance to win a cartridge! holy, this cut made a GORGEOUS card! She is adorable. Thanks so much much for sharing! Thanks for all you do and the opportunity to win. What a super cute card! Gotta love Minnie! This card is a cutie! I would love t win this cartridge! That card is a-mazing! Wow! Super card !! Love it!! I really would love to win this cart. I have been wanting this one. Thanks for the chance to win it. How fun to be on a Disney Blog Hop. Your talents are reaching far and wide! Thanks for the chance to win a cartridge! Love the card! You always have such great projects! What an adorable card and such a nice giveaway. Such a great card - have not tried the shape cards but see I need to. Love to win the cartridge. Thanks for the chance. I've been a follower of yours for a long time. Who doesn't love Minnie Mouse? What a sweet card. LOVE Disney. Love your cute card. and love your blog! I love Mini Mouse, she turned out adorable. Love your card! I always wonder how you get the shaped cards to stand up. TFS! how totally perfect is that polka-dot paper!!!! Love the card! Wish I was in Disney Land. Thanks for a chance to win! Very cute card! I'm a new follower! CUTE CARD, I MIGHT HAVE TO TRY TO MAKE ONE. Your card is so cute. Thanks for sharing and the chance to win. Lovin your card, it is too cute, the polka dot bow is just perfect for Minnie. I am a long time follower of yours and love all of your tutorials, especially on the E2 since I only know how to use with a Gypsy! I love your adorable Minnie card. Thanks so much for sharing this with us. I love everything that you make!!! Thanks for the chance to win the cartridge. Your card is so cute thanks for sharing and the chance to win. I'm a new follower and excited to check out your whole blog. I love the Birthday card you posted on the 23rd also. Your card is absolutely adorable! I love it and Minney! Really cute shaped card! Thanks. Great job Christina. Luv this. I grew up on Mickie and gang, so I just can't get enough of them. Your Minnie card is adorable. I love your card! It's so adorable.